NEW YORK (AP) — For the first time in a long time there is no real consensus No. 1 pick in the WNBA draft. 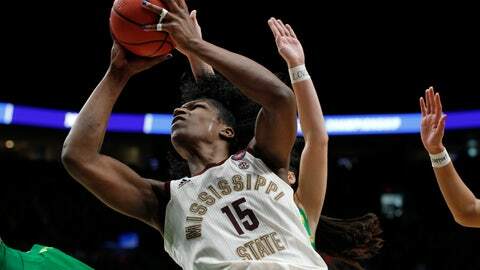 The Las Vegas Aces have the top choice in Wednesday night’s draft and could take Asia Durr of Louisville, Jackie Young of Notre Dame or Teaira McCowan of Mississippi State — or they could go in a completely different direction and trade the pick. Las Vegas also had the No. 1 pick the last two years. The team’s final season in San Antonio resulted in them drafting Kelsey Plum first. In the Aces’ inaugural year, they took rookie of the year A’ja Wilson. Longtime Minnesota Lynx coach and general manager Cheryl Reeve agreed with Laimbeer. “There’s not that sort of generational player, an A’ja Wilson that’s clear-cut, but I feel there’s a fair amount of really good players who will have great careers in our league,” Reeve said. “There is always going to be somebody that really surprises you that probably reaches near that elite level, but I’d say from that point from what we can tell of their college careers, there’s a handful that will be All-Stars. Will they be the elite? Probably not, but this is a heck of a draft in terms of getting a very good player. SHOULD I STAY OR SHOULD I GO: Oregon guard Sabrina Ionescu decided to stay in school for her senior season. INTERNATIONAL FLAVOR: Four non-Americans could get drafted in the opening rounds, with Han Xu of China and Ezi Magbegor of Australia leading the way. The two budding stars have been playing overseas and excelling. Xu would be the first Chinese player drafted since 1997 and Magbegor would be the latest in a long line of talented Australian players. Alanna Smith of Stanford, who is Australian, and Bridget Carleton of Iowa State, who is Canadian, could also get taken early. Smith was the MVP of the Pac-12 Tournament, and Carleton was the Big 12 player of the year. EARLY ENTRANT: Notre Dame guard Jackie Young decided not to return for her senior year and entered the draft Monday night. FAB FIVE: Notre Dame could have all five of its starters drafted on Wednesday night, with Arike Ogunbowale, Young, Jessica Shepard, Brianna Turner and Marina Mabrey all expected to be taken at some point in the three rounds. Tennessee is the only school to have that occur with college players, in 2008. Candace Parker was taken first. Alexis Hornbuckle was drafted fourth. Shannon Bobbitt and Nicky Anosike went back-to-back in the second round and Alberta Auguste was taken in the third round. The Lady Vols also had five players taken in the 1999 draft, when it was four rounds. Chamique Holdsclaw went first and Kellie Harper was taken in the fourth round. Former Lady Vols Tonya Edwards, Lisa Harrison and Carla McGee were drafted, but they played the season before in the ABL, which folded in December 1998. UConn had four of the top six picks in the 2002 draft. POST PLAY: This might be one of the deepest drafts for talented college post players with AP Player of the Year Megan Gustafson, Kalani Brown, McCowan and Kristine Anigwe all expected to go in the opening two rounds. All four are in New York for the draft.